Singer Kim Bum soo will open the world tour to celebrate the 20th anniversary of his debut. 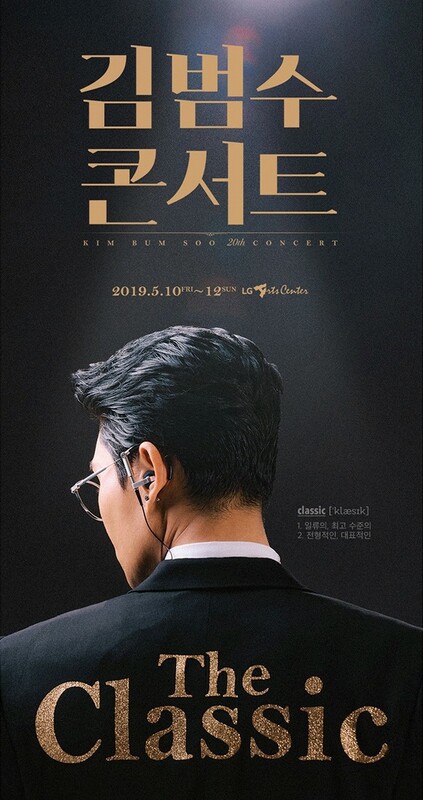 Kim Bum soo will hold the "2019 Kim Bum soo Concert 〈The Classic〉 Seoul" at LG Arts Center in southern Seoul for three days from May 10 to 12. The concert will be held by Kim Bum soo to commemorate the 20th anniversary of his debut and will be held on a total of 20 city tours at home and abroad. In addition, the sophisticated image of Kim Bum soo in the poster released with the title "The Classic" is drawing attention. Especially, Kim Bum soo plans to present the most ideal and pure form of masterpieces with a large orchestra and present a more complete and lively live performance to the audience. The agency said "Kim Bum soo will only perform for the audience to repay the fans who have consistently loved him for 20 years, I ask a lot of attention to the concert "The Classic," which will be filled with beautiful harmonies made with Kim Bum soo, the representative of Korea, and a large orchestra." Tickets for the "2019 Kim Bum soo Concert <The Classic>" Seoul performance will be booked through the online booking site Interpark and the LG Arts Center at noon on 29, and tickets for performances in Incheon, Busan, Jeonju, Daegu and Seongnam will be opened at Interpark following an hour interval.